The Lost City of Qalhat.. Some six or seven kilometers of graded track off the ancient town of Sur, on the eastern seaboard of the Sultanate of Oman is a legendary lost city. The track winds up through the yellowstone mountains and the view of the wide sweep of the sea from atop the cliff, before the track descends into a village, is unforgettable. It is easy to imagine the great ships coming in to anchor, laden with goods from the east and a flourishing port city waiting to export its valued products. Nothing stands in its place today to show the visitor its ancient splendor, except the ruins of a tomb and for hundreds of meters on either side, and almost as far as the eye can see ahead the debris of a lost settlement. Millions of shards of Chinese pottery, some of delicate hue, litter the ground which slopes gently into a very active sea. So active, that the pebbles on the shore – there is no sand – are perfectly rounded like glass marbles, some translucent, but each with many tales to tell. There are also some fertile oyster beds in which local fishermen occasionally find good catches. Qalhat or Kalhat was once known to seafarers worldwide as Calatu and was once an important coastal town in Omani history – dating back to the Azdi migration into the country, sometime in the second century AD. Malik bin Fahmi led the first wave of Arab immigrants into present day Oman sweeping northwards until he reached Qalhat and colonized nearby Jalan. The town was located at the mouth of a pass which led to small fiefdoms in the interior and had a beautiful, natural harbor. Wadi Qalhat - the watersource of Qalhat today. 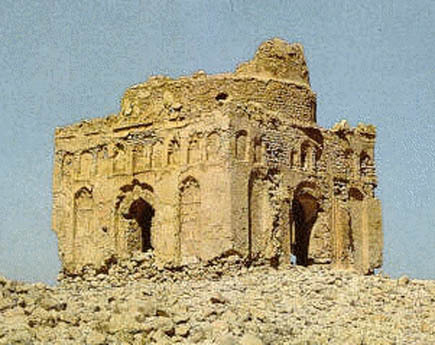 Omani government publications say that Qalhat evidently had some existence then because of its position on the maritime route in the Gulf and this was what attracted the Persian princes and the Azdis. Local history narrates several confrontations between the Azdis and the Persians. The cliffs of the Eastern Hajar mountains rise just along the coast and Jebel Bani Jabir, the highest peak of the spine – some 2,200 m high – is just a little inland from Qalhat. The outlines of many houses, cisterns, streets and buildings can be clearly seen from a height. It is believed that the broken Chinese celadonware and Persian pottery were meant for trade to the interior. The only standing structure is thought to be the tomb of Bibi Miriam, a local noblewoman. It is a mystery as to how it withstood the mammoth destruction all round it down the ages. The town’s prosperity was at its zenith during the sway of the rulers of the Hormuz who controlled an empire stretching from Iraq to the Indus and East Africa beginning in the 12th century and continuing through the 14th and 15th centuries. For about 300 hundreds, the town flourished and came to be known as the New Hormuz. In fact, the traveler Ibn Batuta was so impressed with the splendor of the city that he wrote: “Were the world a ring, (New) Hormuz would be jewel in it…” Ibn Batuta, who visited Qalhat in the 14th century, when Omani seafarers were known throughout the littoral states of the Indian Ocean for their skills, described the town as “having fine bazaars and an exceedingly beautiful mosque, the walls of which are decorated with elaborate enameled tilework and which occupies a lofty situation overlooking the town and harbor…(Ibn Batuta says the tomb of Bibi Mariam was actually a mosque built by her). “There is a wall the height of a lance, which comes down from the mountains and reaches into the sea.” This, he says, was made by local residents because of their love for the “Moors of the Interior,” which was ruled by a king called the Benjebar. Apparently the Benjebar had a large cavalry (and the horses of Calatu are also favorably mentioned by the great Marco Polo). Evidently, the city had begun to decline by this time and archaeologists believe it was during this period that it was completely destroyed. 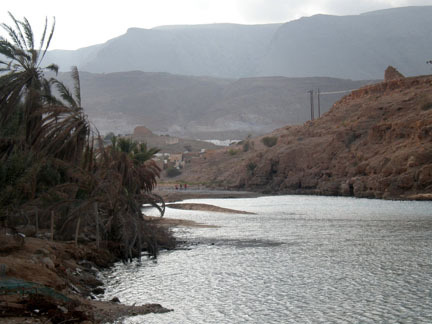 Local tradition says it was a severe earthquake that shattered the city, but it is also probable that the anchorage could have been flattened by flash wadi (stream) floods, which are very common in the Sultanate. Muscat, Quryat and other cities closer to the mouth of the Gulf soon began to rise as major port towns. Today, the creeks of Qalhat are silted up and nothing remains. A new village with solid, white-washed walls is growing nearby although there is no port yet. 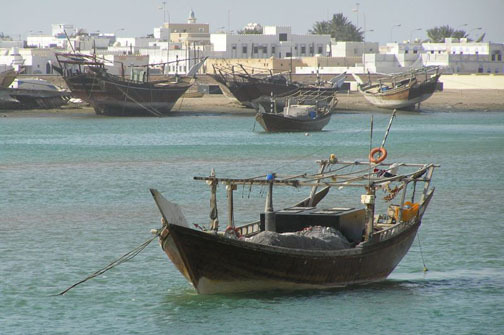 The sea-going tradition transferred itself over the years eastwards to Sur which now boasts itself as the center of Oman’s dhow-building industry. (This article first appeared in the Times of Oman, the national newspaper of the Sultantate of Oman, published from Muscat).